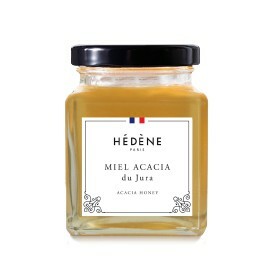 Hédène acacia honey is sweet and refined. 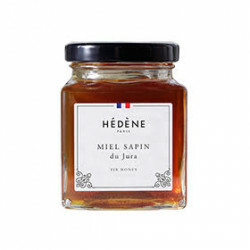 Harvested in Jura, with purely traditional beekeeping methods, Hédène acacia honey is particularly fluid. Its crystal clear color testifies a high quality. It is a sweet and floral honey, with incomparable refined aromas. Its taste is lightly fruity. Its flavor is fine and its scent is subtle. This honey is appreciated for its liquid texture, transparent and clear. Its lightly floral sweetness, without acidity and bitterness, pleases every member of the family. Well-balanced and harmonious, it wins epicures’ unanimous support. Acacia honey blossoming period goes from late April to late June. Harvest happens from mid-May to the end of July. 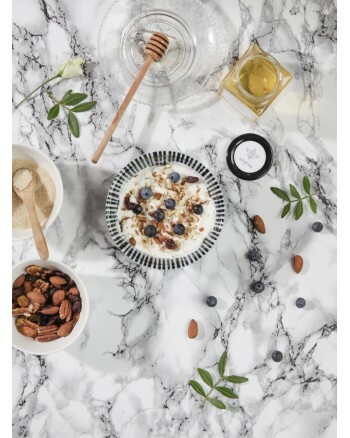 If you are preparing a brunch for your family or friends, Hédène acacia honey is ideal to go with this friendly moment. In fact, its sweetness and delicacy make it useful and appreciated for multiple occasions: with hot drinks, pancakes, waffles or dairy products. With fresh fruits and eggs, Hédène honey-based brunch will be a source of vitamins, refreshment and mostly, greed.